New Delhi: The all new Honda Amaze has been launched in India very soon after its global debut in Auto Expo 2018. It will be available in both petrol (priced at Rs.5.60 lakh to Rs. 7.80 lakh) and diesel (priced at Rs. 6.70 lakh to Rs.8.99 lakh) variants. 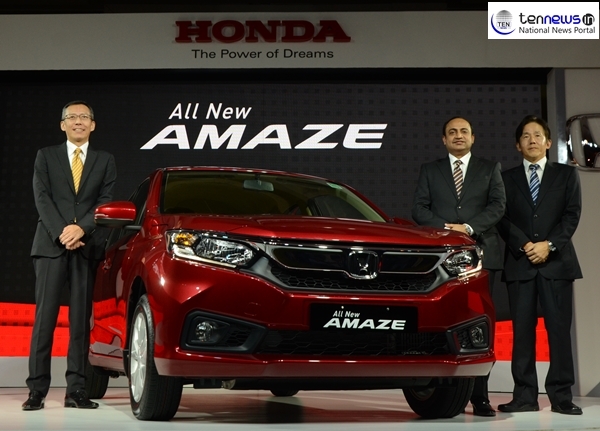 Honda Cars India began the bookings of the all new Amaze early in April 2018 and the first 20,000 customers will be offered the Amaze at these introductory prices.The new Amaze also features new CVT technology, offering a powerful and effortless driving experience. This is Honda’s first diesel engine combined with advanced CVT. The car is available in six variants in both petrol and diesel which includes automatic variants of the compact sedan. The V CVT the top petrol variant is priced at Rs 7.99 lakh whereas the top diesel variant is priced at Rs 8.99 lakh. The other five variant of the Amaze Petrol includes S CVT, VX MT, V MT, S MT and E MT which are priced at Rs 7.30 lakh, 7.57 lakh, 7.09 lakh, 7.49 lakh and Rs 5.59 lakh respectively. The five diesel variants excluding the top variant mentioned above are S CVT, VX MT, V MT, S MT, and E MT which are priced at Rs 8.39 lakh, 8.67 lakh, 8.19 lakh, 7.59 lakh and 6.69 lakh respective. All the prices mentioned above are all India Ex-showroom prices. The new Honda Amaze will compete with the likes of the, Hyundai Xcent, Ford Aspire, Maruti Suzuki Dzire, Tata Tigor and the Volkswagen Ameo in the Indian market. [3:55 PM, 5/16/2018] Saurabh Tennews: Pashchimancial Vidhut Vitran Nigam Limited is going to take a big step towards conservation of electricity. Department is planning to plant solar panels over the roof of his all sub-divisional power stations. Foundation stone of solar panel in the office of both the Superintending engineer will be laid down by AMD of Meerut zone. According to officers for this project government has done a tie-up with a company named NP Agro India costing 39 crore . Company had to follow the instruction given from administration side and have to complete the work within 9 months. Energy minister Sri Kant Sharma is focusing over solar energy so the chair man of Pashchimancial Vidhut Vitran Nigam Limited planed to setup solar panels at Electricity department. Superintending engineer of electricity department A K Singh told that government is promoting solar energy so the departmental officers has planned to setup solar panels of 100 kilo watt all the sub-stations.